The Red Card Campaign on Youth Jobs will be launched as an initiative under the Open Society Foundation on 12th March 2012 at Mulungushi International Conference Centre. Initiative coordinator Sunday Chilufya Chanda has explained to the Watchdog that the launch is open to all interested parties and cuts across political affiliation. ‘We have spent the last one month spending time with youths from different walks of life. One thing is true that Jobs is their number one priority,’ he explained. Chanda said the campaign will drum it into Government’s ears until they deliver. The Campaign aims at pushing the Government to deliver practical jobs and job opportunities for young people through ensuring that they have the right policy frameworks which support and attract labour-intensive and capital intensive projects favouring youths. The youth agenda should not just be subjected to piece-meal interventions but seeks long-term solutions to specific challenges facing youths such as street vending and the lack of a policy that inhibits them from making significant progress. The campaign also demands that the PF Government comes up with a permanent solution to street vending. The Campaign will also remind the PF Government not to pay a deaf ear to the majority youths who voted for it. They have a moral obligation to deliver to this constituency. Of course we do not expect them to deliver everything at a goal but we demand that they start looking like they are serious about delivery to the youths. In the next 30 days, we will press the Government to ensure that a Jobs Bill is taken to Parliament and mechanisms must be in place to show in quantifiable terms how they hope to reward the youth vote. 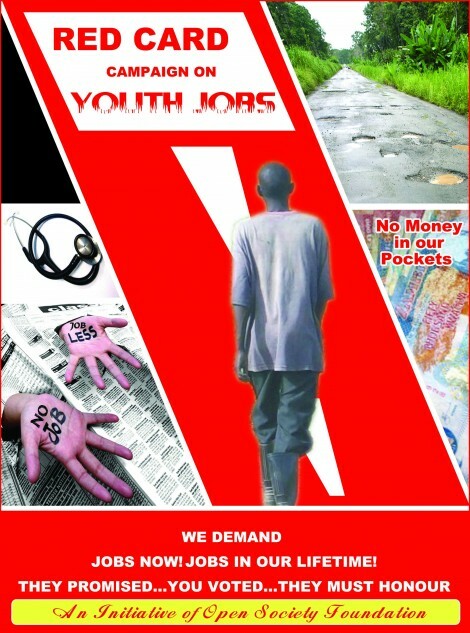 On Youth Day, the RED CARD CAMPAIGN ON YOUTH JOBS is calling on all youths across the country to march for Jobs. The message must be very clear because this day belongs to the youth. Instead of matching past the President or any Government official and later fed with a speech written on their behalf by technocrats, the Youth have it upon themselves to ensure their message is loud and clear: A JOB IN MY LIFE TIME! It is only fair that the Government must get serious about creating an environment that rewards youths with jobs and job opportunities. The RED CARD CAMPAIGN ON YOUTH JOBS is also calling on Government to re-introduce the Mining Windfall Tax so that part of the revenue can go towards empowering existing and emerging youth entrepreneurs in the country. We are disappointed that the Government has resolved to remain silent over some of the hot issues it stood on while in the Opposition. We will not give the PF Government any room for them to sell-out the Youth Jobs Agenda which it used to entice youths to give it a vote.